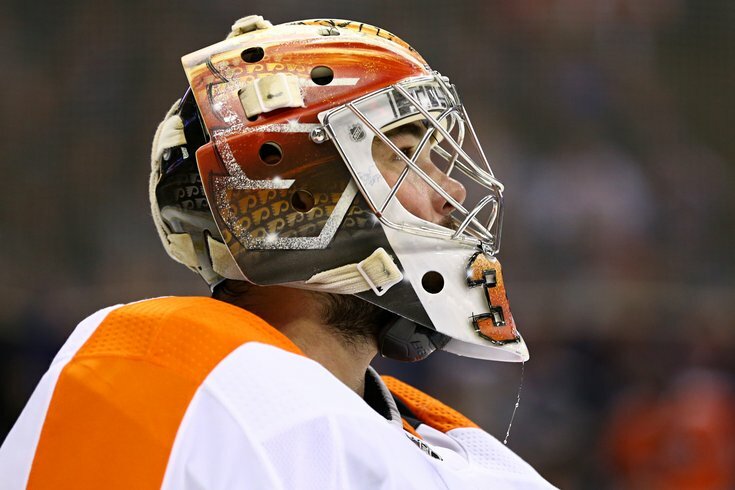 Philadelphia Flyers goaltender Michal Neuvirth left Sunday's 7-4 win over the Rangers with a lower-body injury. Just a few days ago, Flyers general manager Ron Hextall addressed the media following the revelation that starting goaltender Brian Elliott would be sidelined for at least five weeks following abdominal surgery to correct an injury that had already forced him to miss a few games last month. With the NHL trade deadline just around the corner and the Flyers trying to hang on to their third-place spot in the Metropolitan Division, Hextall said his team would ride with backup goalie Michal Neuvirth and Alex Lyon, a 25-year-old with just three previous NHL games under his belt. Anthony Stolarz, who was expected to be the Flyers third goalie this season, has been out with a knee injury but could be available at some time in March. Still, Hextall left open the possibility of the Flyers adding a goalie before the deadline. And, at least for the time being, there are options. "I can’t say I will go with the 23 guys on our roster right now. I don’t know what is going to come up," Hextall said on Tuesday. "I’ll repeat what I always say, if we can make our team better in any position, you know we will look at it." On Sunday against the New York Rangers, the GM's "I don't know what is going to come up" warning seemed almost prophetic. Neuvirth, who has had his fair share of injury issues in the past, didn't return to the ice following a first period in which he allowed three goals on 14 shots. Instead, it was Lyon between the pipes – and after Neuvirth's performance to that point, there was speculation he might have simply been given the rest of the day off. G Michal Neuvirth has a lower-body injury and will not return to today’s game. Details of the injury, including it's severity, are currently unknown, but there's at least a chance it occurred on Mats Zuccarello's goal in the final minutes of the first period. Neuvirth didn't face any shots after this. Lyon played well in relief, stopping 25 of 26 shots in the Flyers 7-4 win at Madison Square Garden. Let's take another look at that one. What this means for the Flyers (30-19-10, 70 points), who still have a week before the February 26th trade deadline to make a final decision, depends on how hurt Neuvirth actually is – and the good ol' "lower-body injury" doesn't tell us much. That, however, is not a great sign. Before this latest blow, Hextall was well aware of his starter's injury history and Lyon's lack of experience and already seemed open to adding some goalie help before the deadline. Most likely, given his recent history at the deadline and personal mandate of never mortgaging the future for a short-term fix, Hextall was shopping for a bargain backup, if anything at all. Now, assuming Neuvirth's latest injury is going to keep him sidelined for more than a couple of games, he might not have a choice but to add a goalie.